Edison State Community College’s second annual Float, Learn and Lunch will be from 9 a.m. to noon on Sept. 21. PIQUA – The Edison State Community College Student Senate invites community members to enjoy nature and have fun on the water while learning about The Great Miami River on the second annual Float, Learn and Lunch from 9 a.m. to noon on Sept. 21. Individuals can be a part of the group of students, faculty, staff and community members who will board canoes and enjoy a two-hour educational float down the Great Miami River. After disembarking, participants will be treated to lunch as they learn from Edison State faculty members about one of the region’s greatest natural resources. During the experience, guests will learn about examining water samples from the Great Miami River and wildlife and environmental characteristics observed during the float. 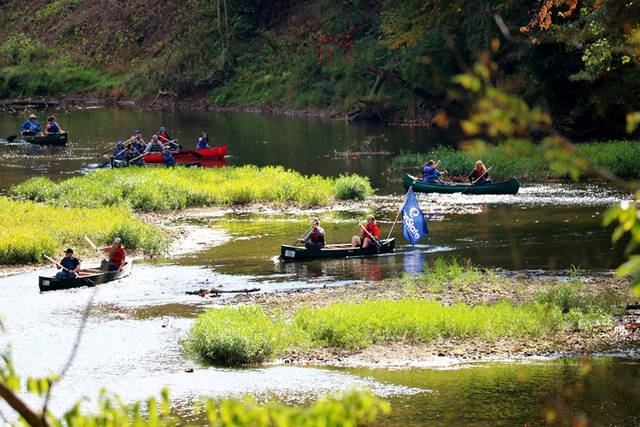 Participants will meet at Edison State’s Piqua Campus and depart by bus at 8 a.m. in order to be on the water by 9 a.m.
For more information and to register, contact studentsenate@edisonohio.edu by Sept. 10. Participation is limited to the first 40 registrants. This event is offered free of charge to thanks to funds raised during last summer’s Down the River, Down a Beer festival and in partnership with the City of Piqua’s River Stewards Program. The Edison State Student Senate serves as the voice of Edison State students, devoting time to help make Edison State the best social, educational and community driven college possible.